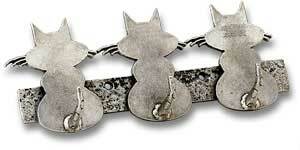 The entire TRIPLE CAT HOOK is made of pewter finished metal. The hooks themselves are crafted into the shape of CAT tails and feature 3 cats just hanging out. It is ideal for placing right near the door. Can easily hold one or two sets of keys along with a leash and a collar on its single long hook. Great for quick organization of your pet walking accessories and/or keys. Pewter finished metal will not rust or tarnish. Mounts easily and is extremely solid.